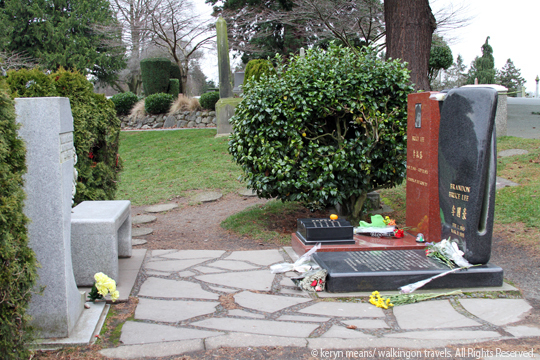 One of the most frequently asked question by martial arts lovers visiting Seattle is “Where is Bruce Lee buried?” The simple answer is Lakeview Cemetery Seattle. The complicated answer is that Bruce Lee is buried next to where Brandon Lee is buried. Neither will be easy to find, which is why we are giving you the directions you need. But first, the backstory of why you would even want to visit Bruce Lee’s grave. Why look for Bruce Lee’s grave? I’m lucky to have friends who are pretty much game for anything. One morning I turned to my friend Nicole. We were with our kids at the Volunteer Park playground, right next to Lakeview Cemetery in Seattle. I asked her if she wanted to wander over to the adjoining cemetery to find Bruce Lee’s grave. She didn’t bat an eye and said yes. Two moms with three kids wandering around grave stones? Nothing weird about that. 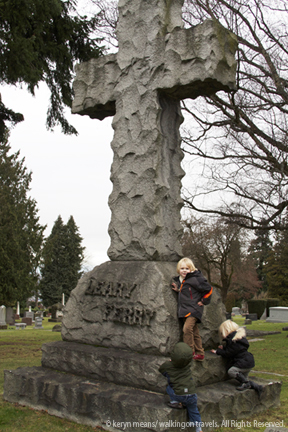 Grave hunting is just one of many things to do in Seattle with Kids after all. Cars were pulling into Lakeview Cemetery at a sporadic rate that morning. Although a funeral was being set up, these cars were here for something else. They were looking for Bruce Lee and Brandon Lee’s gravestones. Just like us. Turns out they were just as clueless as we were too. Bruce Lee wasn’t the only one making a statement at Lakeview Cemetery. Check out the tree stump memorial. Now, I don’t know if you troll around cemeteries very often, but most don’t come with signs pointing to the local celebrities. Kurt Cobain’s gravesite is in Lakeview Cemetery, but they are very careful not to advertise exactly where he’s located. If they did, Nirvana fans would be camped out next to Kurt Cobain’s gravestone for weeks at a time. Honestly, we really had nothing to go on to start our search for Bruce Lee’s gravesite. I figured there would be a bunch of flowers, but given that it was the holiday season, there were flowers everywhere. We found a few pictures via our iPhones of Bruce Lee’s grave, so we knew what the gravestone looked like at least. Still, we couldn’t find it. We even looked up directions! I guess we aren’t the only ones to get lost. After a few sites I finally found directions that made sense. We had come in the wrong entrance, but at least we finally had a few monuments and a flag pole to go by. Nicole, our kids and I trudged up the hill. The advantage we had over the cars was that we could cut across the grass as we searched. Cars had to take a much more roundabout route to find Bruce Lee and Brandon Lee’s graves. The kids got distracted every step of the way. We tried to be respectful. Nicole and I made a game for the kids. We instructed them not to step on nameplates and walk around grave headstones. If the kids stepped on a grave, they lost a point. We were on a treasure hunt. Our clues were a stone with a picture of a man on it. There would also be a big cross and a view of the lake. Which of the kids could find it first? Finally! We found the flagpole and the large cross at the top of the hill that our directions had mentioned. Nicole shouted that she had found Bruce Lee’s gravesite as I tried to pull my son away from a pile of twigs. Our kids were overjoyed. They had no idea what they were looking at, but they knew the treasure hunt was complete. 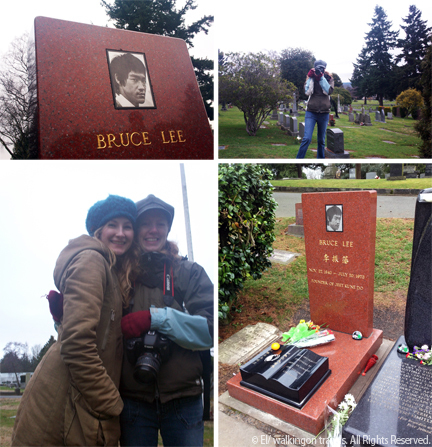 Nicole’s son pulled out his camera to snap some pictures of Bruce Lee’s grave and Brandon Lee’s gravesite. Nicole and I checked out the memorial of flowers, fruit and even snow globes that were piled up for the holidays. And then we moved on. The kids were bored and wanted to explore the other cool monuments in Lakeview Cemetery. Our respects had been paid to Bruce Lee, the martial arts master, and his son Brandon Lee, and it was time to go. Funny thing is, once we found Bruce Lee’s grave, other people started to pull up to the gravesite in their cars. They had been driving around longer than we had been looking. I guess they were just waiting for us to figure out where to go. As we left the cemetery, a car pulled up and ask us where Bruce Lee was buried. We were proud to be able to point them in the right direction. We were pros at this point. They didn’t need to know that we had wandered around lost for a while ourselves. Now we are on the hunt for monuments to other local legends… I hear Jimi Hendrix is close by. Walk into the cemetery entrance on your left. Walk straight up the hill. Cut through the grass. Do not stick to the path. When you are at the top of the hill you will be standing on a path/road. You will see a very large stone cross in front of you and a flagpole. Turn around and look at Lake Washington. Directly in front of you is a coral colored gravestone and a black gravestone. These are Bruce Lee and his son Brandon Lee. There is a very nice bench to sit on and meditate on both men’s amazing, yet short lives. This is not an amusement park. It is a cemetery. No picnic tables, nothing. If you are headed to the Emerald City, you will need a warm and dry place to relax. Seattle has a number of great places to stay as you explore some of our favorite things to do in Seattle. You can’t go wrong booking a room at the Four Seasons, while the Pan Pacific and Westin Seattle Downtown also offer lush rooms in the heart of downtown Seattle. Check the best rates and availability for Seattle hotels now! If you are looking for great deals, check out hotels in the neighborhoods closest to downtown– Capital Hill, Fremont, Ballard, Queen Anne and First Hill. You will find great weekend prices in Bellevue or Kirkland if you don’t mind commuting into Seattle to explore. 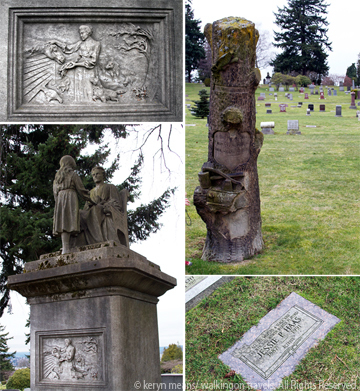 Interesting Story – there are so many in cemeteries, aren’t there? I had forgotten that his son had died as well. Was the Big cross a monument to someone as well? The cross was for the Ferry family. There were about 8 of them surrounding the cross. I believe a few in-laws as well. That’s definitely a different way to spend you afternoon. I wouldn’t have thought it would be so hard to find somebody in a cemetery (I haven’t spent a lot of time in them), but I guess it makes sense to keep the location of some people’s graves a secret. On the other hand, if you really want it to be a secret, don’t put your name and picture on the grave marker. What a fun hunt! Wish I could have come along. I was thrilled when I learned this past summer that you enjoy cemeteries as much as I do. There are so many stories to tell. Why not provide a link on your page to take people to the one in Melvin Village? Definitely an interesting way to spend your afternoon! 🙂 Now I’m amazed that you were able to provide directions. If I had been wandering around until I eventually stumbled upon the gravesite then I would be lucky to find my way back out let alone be able to give step by step directions on how to get there. I find cemeteries very interesting too. And the kids always enjoy being outdoors. Not a bad day! My kids think looking for people’s graves is a very weird way to spend a day, but I think it is fascinating! Good thing you were there, or those other poor people would have never made it. What a great day outing! Cemeteries are very interesting places. The history and knowing each headstone marks a life and it’s own story. Quite interesting. I actually spent a couple of hours at the oldest cemetery in New Orleans when I visited in May. I was intrigued by the above ground burials.